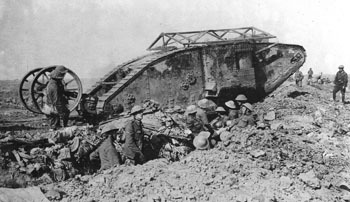 The pair of tail wheels on a Mark I tank seem to fascinate most people; they are in fact the rump of the articulated Landship idea devised by Colonel Crompton. 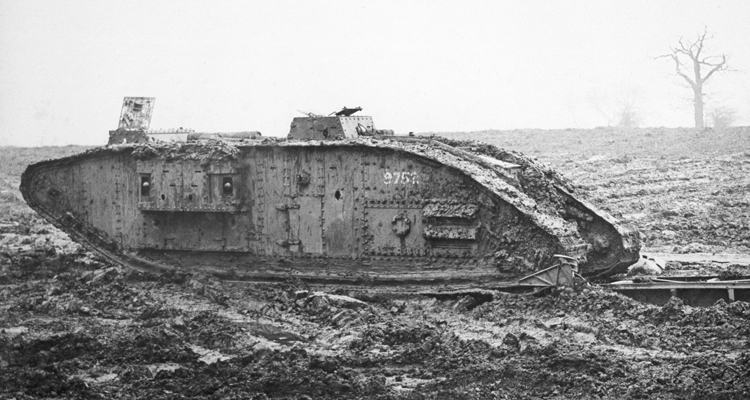 The Tank Museum’s Mark I tank with tail. The tails were removed from these tanks before the year was out and never fitted on later models, they were more trouble than they were worth. Tails were only otherwise fitted to fifty Gun Carrier machines and a modified tail, to help with trench crossing, was fitted to an experimental Whippet tank but soon abandoned. The wheeled tail served two purposes, in the first it was a steering aid, indeed it was the normal method of steering a tank to begin with. Steering was controlled by a steering wheel in front of the driver. This worked with wire cables attached to a sort of tiller bar in the tail assembly which in turn activated the wheels on the Ackermann principle. With these ‘hard over’ the tank could describe a 60 foot circle. Multiple springs on a cross bar kept the wheels in contact with the ground and they would follow the contours of the ground, behind the tank. 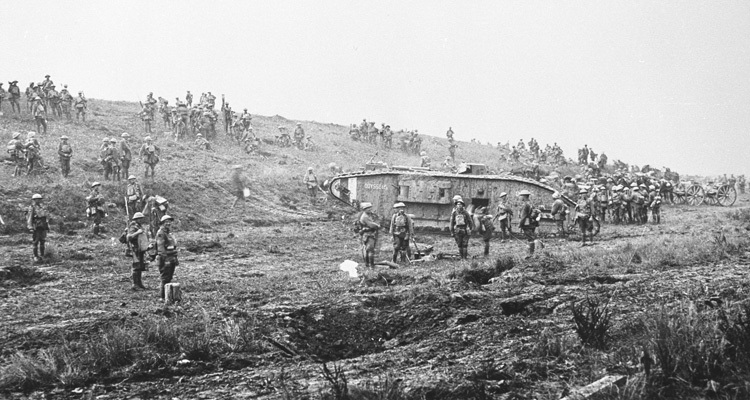 Mark I male tank C15, going into action near Thiepval with its steering tail raised clear of the ground. One of the strange things from those early days was that many tank crews believed that this steering gear was an integral part of the mechanism, so if it was damaged in any way the tank was deemed to have broken down and could go no further. In fact it was just one method of steering, and could be disregarded. In its other guise the entire tail assembly was a form of counterbalance. 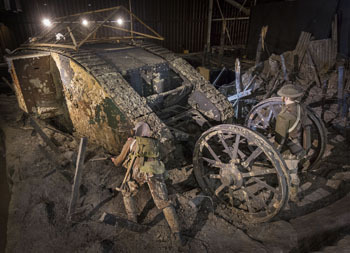 The tail was pivoted against the hull near its forward end and a hydraulic jack, sometimes referred to as a ‘cataract pump’, was situated on the rear wall of the tank. By pressing down on the forward end of the tail it was lifted upwards and held clear of the ground. 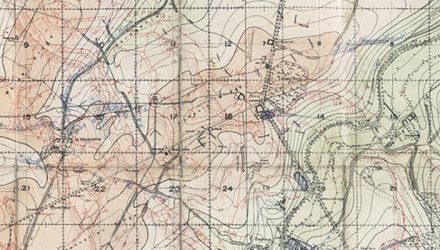 It was used to alter the centre of gravity of a tank when crossing over a high crest, or indeed sometimes as a trench crossing aid if required. Tanks were sometimes seen with a large wooden box on the tail, this was an extra stowage box for carrying spare cans of petrol and other stores. For more information on the Mark I see David Fletcher’s Tank Chat on the Mark I and a profile of the Mark I tank. 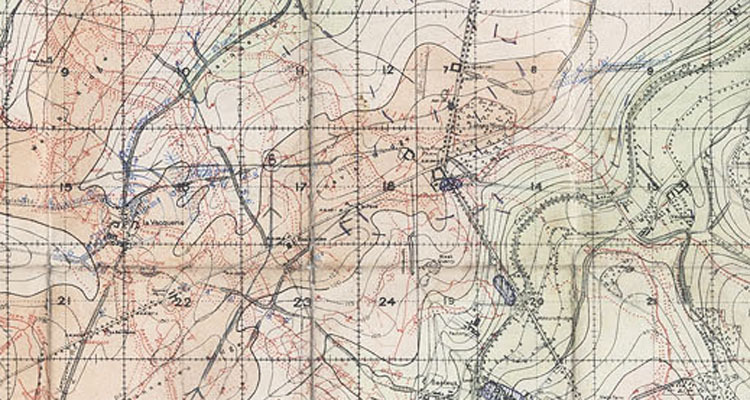 Find out more about tank development and First World War tanks in the books below. Thank you! 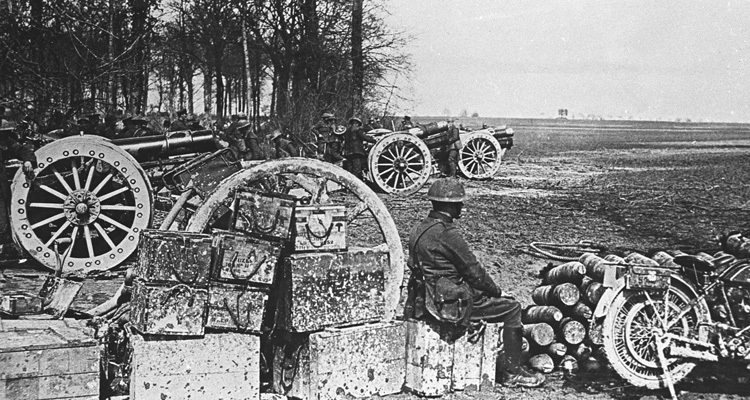 I have been seeing pictures of WW1 tanks for 1/2 a century and wondered what those “trailers” were for LOL. I wondered if that was the fuel tank which was placed outside to protect the crew. I’m glad to be corrected.